Partner Paul Rice and his wife, Kristi, (second couple from left) along with three other couples attended the Futures Caribbean Feast, which is an annual fund raising event for the Futures Foundation for Volusia County Schools. 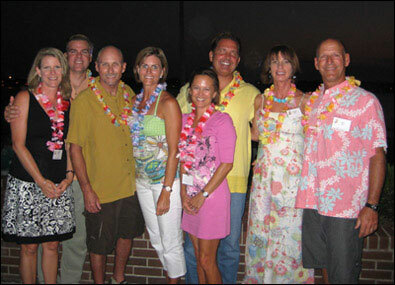 The Rice & Rose Law Firm has been a sponsor for the affair for the past five years. It took place on May 1, 2009 at the social hall of the Greek Orthodox Church in Daytona Beach, Florida. Guests were treated to gourmet island cuisine prepared by top local executive chefs, complimentary beer, wine and beverages as well as Caribbean music and entertainment. For more than 20 years, the Futures Foundation has supported Volusia County Schools through scholarships for students, drop out prevention programs and grants for classrooms, student and staff recognition. For more about the Futures Foundation or to contribute to the cause, go to its website at http://futuresvolusia.org/.